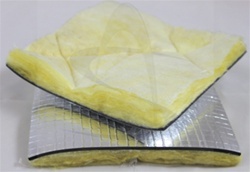 Decoupler Pipe and Duct Wrap insulation, PDW-101, combines a 1 pound per square foot, 1/8" reinforced, foil-faced, mass loaded vinyl noise barrier (MLV 1#) with 1" thick quilted fiberglass insulation. The scrim-faced fiberglass enhances the sound absorption quality of the barrier. 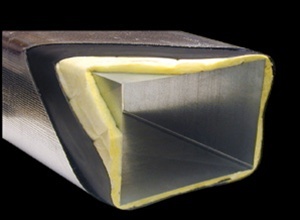 Pipe and Duct Wrap insulation offers excellent thermal and acoustical performance in a Class A fire-rated product. Standard roll sizes are 4.5' x 30', 135 SF. Installation of Pipe and Duct Wrap around noise pipes or duct work may yield up to 20 dB reduction. DECOUPLER Pipe and Duct Wrap PDW-101 is designed to block noise that transmits through the walls of the pipe as it increases the sound absorption in the cavity.